Wombats have been likened to badgers, bears, beavers, even pigs; but although there are some similarities of appearance and habits, there is no relationship between the wombat and any of these animals except that they are all mammals. The wombat is a marsupial, whose tiny embryonic young are born after only about 30 days in the uterus of the mother and then spend about eight months in her pouch. The badger, bear, beaver and pig on the other hand are all placental mammals, whose young develop in the uterus of the mother for several months before their birth at a relatively advanced stage of development. The marsupials are divided into four major groups, or Orders. 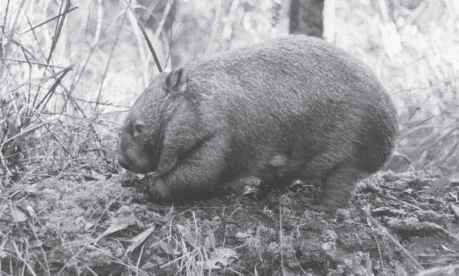 The wombats belong to the Order Diprotodonta. All the members of this order have only two incisor teeth in the bottom jaw, these teeth pointing forward almost horizontally, and syndactyl toes on the hind foot - a condition in which the second and third digits are partly fused together. Koala have a specialised gastric gland, and their sperm, which are very similar in shape but unlike those of any other marsupial. Experiments with blood serum of the wombats and the koala have shown that they are possibly closely related, and it is thought that they probably shared a common ancestor about 25 million years ago. The full classification of the wombat and its relationship to the koala is shown in Table 1.1.